Taste test: Wow, these rock! The taste was much more impressive than the original flavored Tasty Jacks. 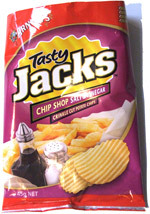 They were a great rippled chip with one of the best salt and vinegar combinations that I have come across. 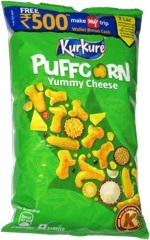 I will definitely be buying these as often as the old favorite of Samboy Salt & Vinegar. I hope the other flavors in the Tasty Jacks line meet this standard. Yum. Smell test: Yummy salt and vinegar aroma (not too much vinegar). From the package: “Why are Arnott's Tasty Jacks so tasty? Because we insist on the highest quality potatoes, grown on Australian farms, for that real potato taste. And we have a unique range of special seasonings created to deliver tastier flavours than ever before. We cut them differently with deeper ridges for extra crunchiness. And finally, each and every pack of Tasty Jacks are foil sealed for freshness. Because Arnott's know [sic] what Australians love."